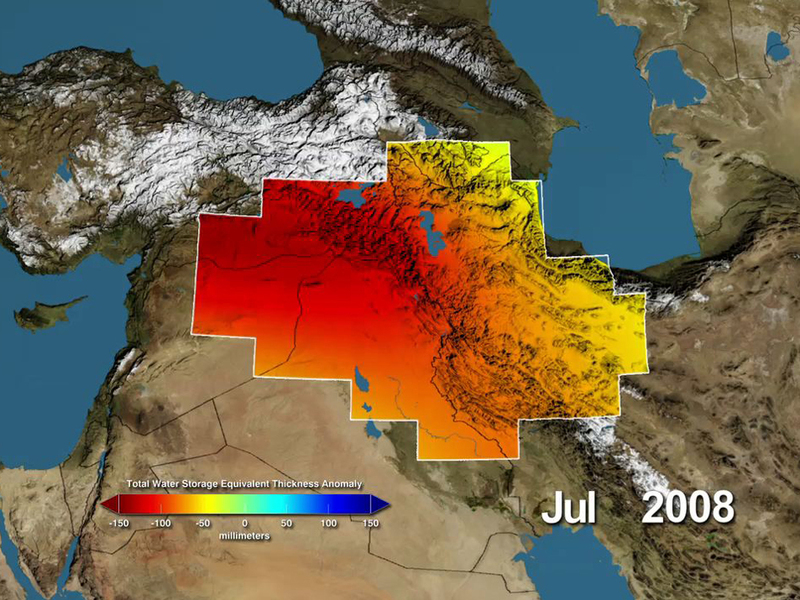 Variations in total water storage from normal in the Tigris and Euphrates river basins, as measured by NASA’s Gravity Recovery and Climate Experiment (GRACE) satellites, from January 2003 through December 2009. Reds represent drier conditions, while blues represent wetter conditions, and measurements are in millimeters. By periodically measuring gravity regionally, GRACE tells scientists how much water storage changes over time. Click image to enlarge. The Tigris and Euphrates river basins, at the heart of the Fertile Crescent, lost enough fresh water between 2003 and 2009 to fill the Dead Sea, according to a study that used NASA satellite data to measure hydrological changes in parts of Turkey, Syria, Iraq, and western Iran. One-fifth of the net water loss was attributed to dry soils and a withered snowpack, the study found. Evaporation from lakes and reservoirs accounted for another 20 percent. The greatest decline in the water balance — the remaining 60 percent — came from pumping out groundwater faster than rainfall could replenish it. The study, to be published online this Friday, February 15, in the journal Water Resources Research, is part of a growing body of research that shows that many of the world’s most important agricultural regions and most densely populated areas are living beyond their means when it comes to groundwater. Yet, basic information about just how much water is available — especially in water-scarce, high-tension regions such as the Middle East — is missing. Voss told Circle of Blue that the research team — including scientists from the University of California, Irvine, NASA’s Goddard Space Flight Center, and the National Center for Atmospheric Research — does not know how the net loss compares to the total water resources of the Tigris and Euphrates river basins, because that figure is either not known or is not made public by the respective national governments, which view water data as a matter of national security. Launched in 2002, the Gravity Recovery and Climate Experiment (GRACE) mission has revolutionized the practice of water monitoring, allowing for broad, regional measurements of both surface water and groundwater in areas that either guard data or do not have extensive monitoring systems on the ground. 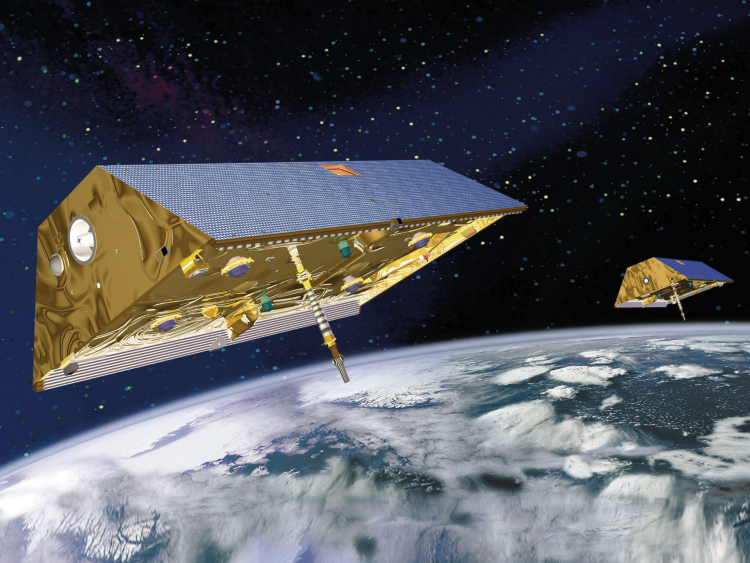 GRACE is a pair of satellites that detect minuscule changes in the Earth’s gravity field. These fluctuations can be translated into a profile of a region’s total water resources. Researchers then use observational data or computer models to work out what portion comes from soil moisture, snowpack, reservoirs, and groundwater. Since 2002, GRACE has relied on twin satellites that complete a full scan of the Earth each month, sending back some of the best data on the variations in the planet’s gravity fields. The program identifies the spots around the world where groundwater is disappearing or recovering. Click image to enlarge. Much of the groundwater depletion in the Tigris-Euphrates can be traced, in part, to a severe drought that began in 2007, the study found. The Iraqi government, for example, drilled more than 1,000 wells to make up for the lack of surface water supplies. Voss said that, during the drought — which began to abate in 2010 — agriculture in the basins’ headwaters in southeastern Turkey fared well, largely because of water stored behind a cascade of dams that has raised regional tensions and led to accusations that Turkey has been withholding too much water from Syria and Iraq. In many areas, even in the United States, pumping from groundwater sources has been the balm to soothe tensions over transboundary rivers. But region by region, the GRACE mission is revealing just how much has been pumped. One of GRACE’s major discoveries came in 2009, when researchers calculated the first assessment of groundwater depletion in northwestern India. They found that, between 2002 and 2008, the states of Rajasthan, Punjab, and Haryana — together, the center of Indian wheat production and home to 114 million people — suffered a net loss of 109 billion cubic meters of groundwater, an amount equal to double the capacity of the country’s largest reservoir. Groundwater is a reserve that people draw on when supplies from rivers and lakes are scarce or below normal. Pump out too much, however, and net losses occur, which is now a problem throughout the world, as rising demand for water is exhausting many of the world’s most important aquifers. According to an August 2012 study in Nature, 1.7 billion people live in places where aquifers are under pressure from excessive use. In addition to the studies of northwestern India and the Tigris-Euphrates, the GRACE mission has also looked at California’s Central Valley, a rich swath of farmland where the water table also dropped. Voss said that the research team will use GRACE data to investigate the groundwater balance in northern China and in South America’s Guarani Aquifer, but those studies are not yet ready for publication. Way back in the mid-1980s, I remember reading an article in U.S. News & World Report then said that freshwater would be the next resource countries go to war over. Now, it’s been about 30 years since that report came out but it’s just a question of time when groundwater sources are depleted and countries have to raid neighbor’s water supplies for crops, cattle and drinking. When ground truth regarding groundwater exploitation and mining are apparent and clear, it is not necessary to obtain the satellite data to appreciate groundwater predicament. Instead the governments / policy makers should devote their time and energy towards capacity building of farmers and groundwater users regarding how to do on farm groundwater recharge and how to use groundwater sustainably on their farms. Who does not know that groundwater is overexploited in most parts of the world? What is lacking is efforts to do on farm recharge, the economics of recharge and the social and private benefits to recharge and sustainable use of water for farming..